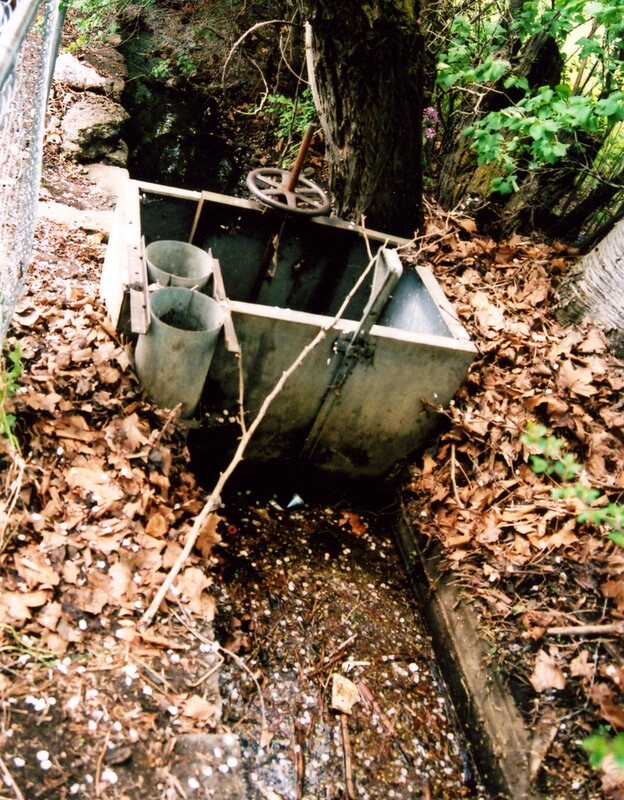 The history of the irrigation ditches of Weber County can be gleaned from court cases spanning fifty nine years of law suits to determine water rights. In the first thirty years of settlement the irrigation ditches were considered public property, and no one filed water claims. In 1880 the law changed to treat the ditches as private property. People began to file water claims after 1880, but many claims were not filed until after 1900. In the 1880s there were so many ditches and so many farmers using the irrigation water without regulation that problems and conflicts arose as everyone was not receiving what they needed. Farmers at the higher end of the canyon took what they wanted leaving the lower valley farmers thirsty. Court cases began in 1889 and the final decree of water rights on the Ogden River was not handed down from the court until 1948. As there were no water claims filed for the first thirty years, much of the early ditch history was unrecorded. 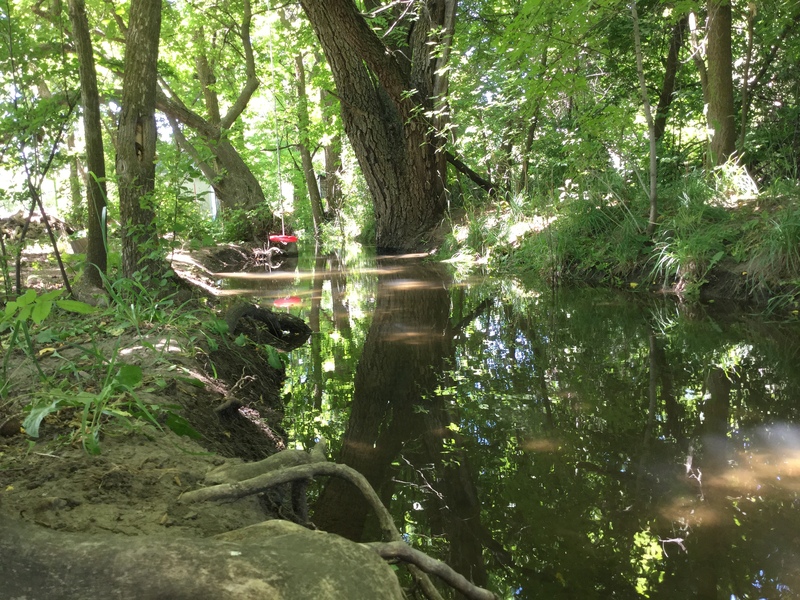 Using information gleaned from the court decrees of water rights, affidavits, and from pioneer life histories, a short summary follows of the building of Mill Creek and the first ten ditches from the Ogden River. 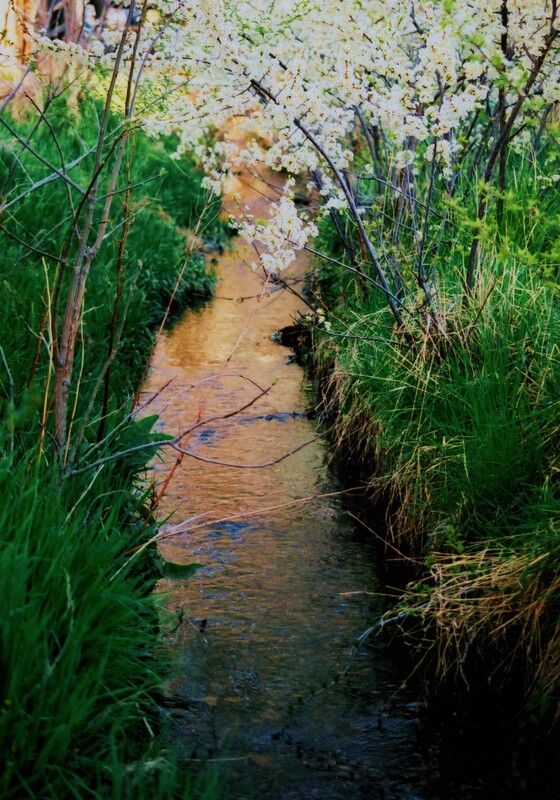 The first ten ditches out of Mill Creek have the oldest water rights on the Ogden River, their priority dates ranging from 1848 to 1851. How was Mill Creek created and who built the first ten ditches? Portraits from Ogden Pioneer Forts and the People Who Lived There, Joyce B. Maw, p. 23. In the spring of 1849 these men including Ezra’s sons, Wells and Henry, ages 19 and 17, turned water from Ogden River into a “swale” or an old, dry creek bed and created a creek that flowed north west of Ogden River. Ambrose Shaw explained in an 1899 affidavit that they made a dam in the Ogden River at the head of a “swale” since known as Mill Creek which flowed in a westerly direction for 2 miles to their farm lands (this would extend almost to Wall Avenue where Ambrose Shaw had his farm), and that they constructed ditches and laterals tapering and intersecting the “swale”, and that the “swale”, ditches and laterals have been maintained since 1849 to the present (1899). 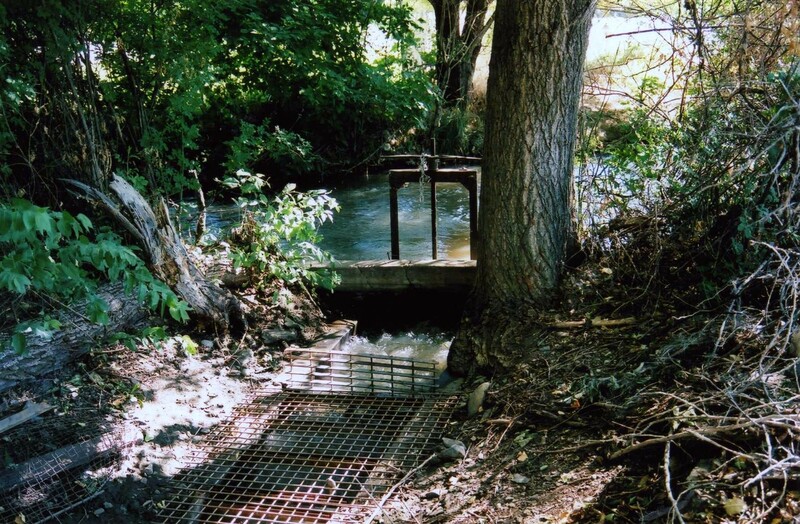 Mill Creek became the main source of water to the communities on the lower northern side of the Ogden River and today still provides most of the irrigation water for these communities. After sending the water into the swale/creek the Chase-Hubbard-Shaw group diverted five ditches. First they created a short lateral ditch running north of Mill Creek to the present area of Monroe and 12th Street (see map below). About 20 years later this ditch was renamed the Enoch Farr ditch, and 100 years later the court awarded it right #1 and priority date of 1848, the year Chase and Hubbard arrived in Weber County. Perhaps the ditch was finished in the year 1849, but it received the priority date 1848 as this was the year of their arrival and the beginning of construction. Charles Hubbard’s farm was located in this area at the time of its construction. Use of this ditch was discontinued in the latter part of the twentieth century. Next the Chase-Hubbard-Shaw group diverted a ditch from Mill Creek to the area of 14th Street east and west of Washington Blvd; this is today’s Mound Fort Ditch #4 (see map below). The court awarded this ditch right #2 and a priority date of 1848. Ambrose Shaw had the first farm in this area and later David Moore joined him locating his farm south of the prominent mound that was a major land feature. The Chase farm was located north and east of today’s Lorin Farr Park; these men dug three short ditches running from Mill Creek to this area; the court awarded these ditches rights number 3, 4 and 5, and priority date 1849. About 40 years later these ditches were named the Asa Farr Ditches. They may have been diverted directly from the Ogden River at first and later from Mill Creek. In time these first five ditches created successful farms; it is recorded that Ezra Chase raised 100 bushels of potatoes in 1849 and a generous harvest of wheat and corn also. Original photographs of these men that built the first ditches can be found in the Ogden Daughters of Utah Pioneers Museum. Use of the Asa Farr ditches was discontinued in the latter part of the twentieth century. The “swale” (colored blue, later named Mill Creek) and the first 5 ditches finished in 1849; 1) Enoch Farr ditch 2) Mound Fort #4, and 3) 4) 5) Asa Farr ditches. 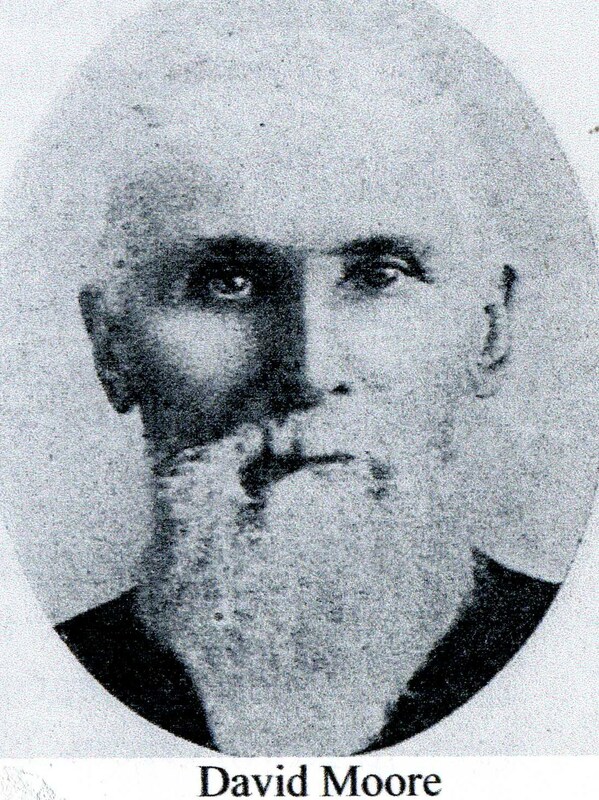 On October 24, 1849, David Moore and the Barker families arrived in Weber County. David Moore was 30 years old, and George, Frederick and Simon Barker were ages 54, 49, and 23. Moore recorded that there were only nine families of white folks in Weber County when they arrived and their group made thirteen families. Moore and his friends initially took up empty cabins left by Robert Crow near the confluence of the Ogden and Weber Rivers for the first winter. The next year they built cabins three blocks east of Washington Blvd. on a wagon trail now called 12th Street. Historically these three ditches were called the Mound Fort Ditch and today’ are called the Mound Fort Ditch #1, #2 and #3. In 1948 the District Court of Weber County awarded these ditches an 1849 priority date, the year that the Moore group arrived in Weber County, and priority rights 6, 7, and 8. Sketch of Mound Fort Ditches: Today’s Mound Fort Ditches #1,#2, and #3 were dug in 1850 by Moore group and are sketched in pattern that is familiar today and with dotted lines showing possible original diversions; these were originally pioneer ditches #6, #7. and #8. Following is a detail of map made from 1855 field notes of an early suveyor showing today’s #4 diversion point from Mill Creek was also the diversion point for MF ditch #1. 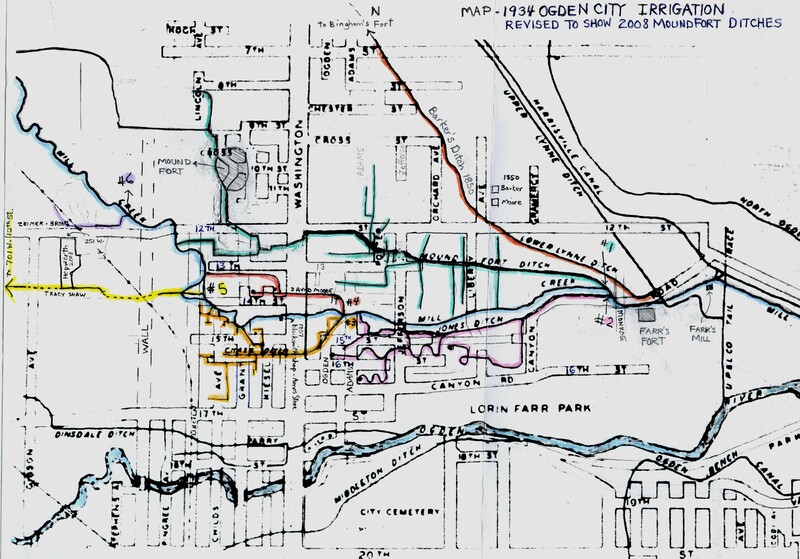 It also shows the Asa Farr ditches coming from the Ogden River instead of Mill Creek. Detail of map from August 1855 field notes of surveyor J. Troskolawski; printed in 1888 from Surveyor General’s Office Salt Lake City, Utah. 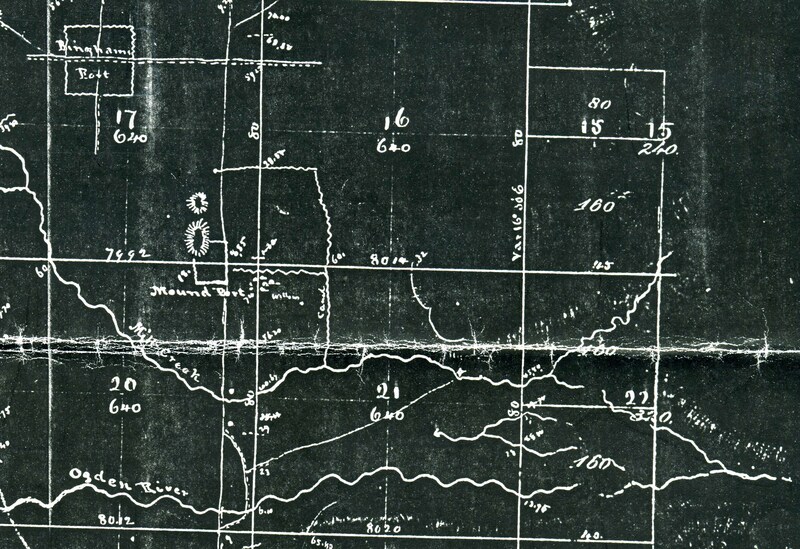 The map above was made to designate the section lines of the North Boundary of the Salt Lake Valley. Most of the information concerns the location of section lines, forts, roadways and rivers. However, in the Mound Fort area the map shows a “canal” which is similar to portions of the Mound Fort # 1 ditch diverting at the #4 location. The Asa Farr ditches divert from the Ogden River. Moses Tracy arrived in Weber County in 1850 settling on the south side of west 12th Street in the 700 block. Ambrose Shaw and Moses Tracy dug the Mound Fort Ditch #5 in 1850; it extended from Mill Creek through Shaw’s farm and on to the Tracy farm. It was given an 1849 priority date, the year that Shaw arrived and right number 9, meaning that it was the ninth ditch constructed out of Mill Creek. This ditch still runs to the old Tracy farm in 2013. Today it is known as Mound Fort #5 or the Tracy-Shaw ditch. See Sketch of Mound Fort Ditches above. At this time the settlers between 12th Street and 7th Street were the last users on the Barker’s Ditch. See Sketch of Mound Fort Ditches above for the Barker 1850 ditch which was the 10th ditch from Mill Creek. Here are key events of 1850: Lorin Farr arrived in Weber County in January 1850, and he also crossed the river and settled with his son-in-law, Ezra Chase, near the mouth of the canyon. Brigham Young sent him to take charge of affairs in Ogden. The Barker Ditch was taken out of Mill Creek after June of 1850 as mentioned above. Because of Indian trouble after the accidental death of Chief Terrikee in September 1850, Farr supervised the construction of a fort around their cabins, and the safety of the fort attracted more families to move there. The Barkers and David Moore moved from 12th Street as pictured in map below into the fort. The fort was named Farr’s Fort. Work on ditches was suspended until the Indian difficulties were resolved. Farr’s Fort located south of 1050 Canyon Road. After resolving the conflicts with the Indians there was still an uneasy feeling between the settlers and the Indians. Brigham Young began sending more immigrants to Weber to secure the settlement. Mayor Lorin Farr, seeing that the people were coming fast and taking up choice spots of land at their pleasure, thus throwing the country into confusion, engaged surveyors in the fall of 1850 and the farming land was laid off into blocks ½ mile wide by 1 mile in length, with potential streets running every mile north and south and every half mile east and west. William Lemon was the first surveyor engaged and the survey was called the LEMON SURVEY in his honor. 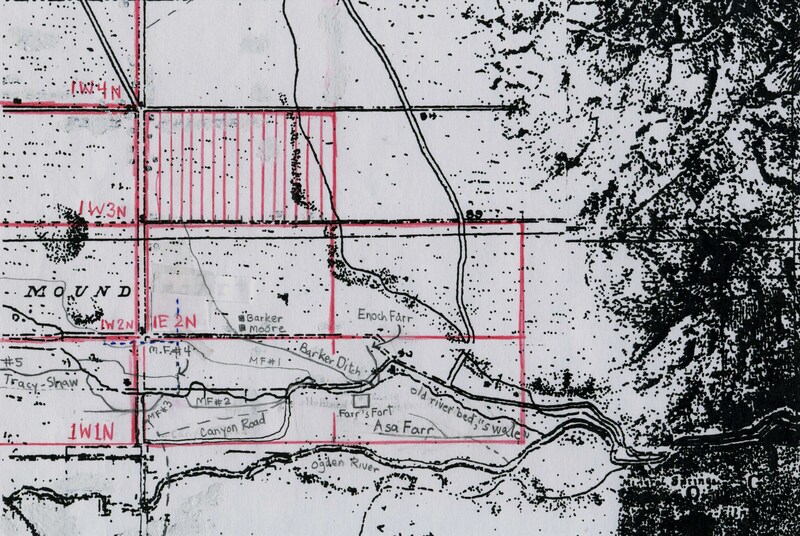 A portion of the Lemon Survey: each block was a mile long and half mile wide and was dividedinto 16 twenty-acre farms, block 1E3N above shows a sample drawing of the farms; the surveybegan at today’s Washington Blvd. and 17th St. and was made to organize land claims and property descriptions. David Moore wrote that emigrants and gold seekers passed through Ogden in 1850 starting the first of June. They camped on the high bench where Ogden City cemetery is now located and passed down the steep north bank and ferried over the Ogden River. It was a continual rush of teams, wagons, pack animals and companies of men until the last days of July. They paid Captain Brown 10 dollars per bushel for wheat and then ground it in a large coffee mill of Francillo Durfeys and paid him for the use of this mill. 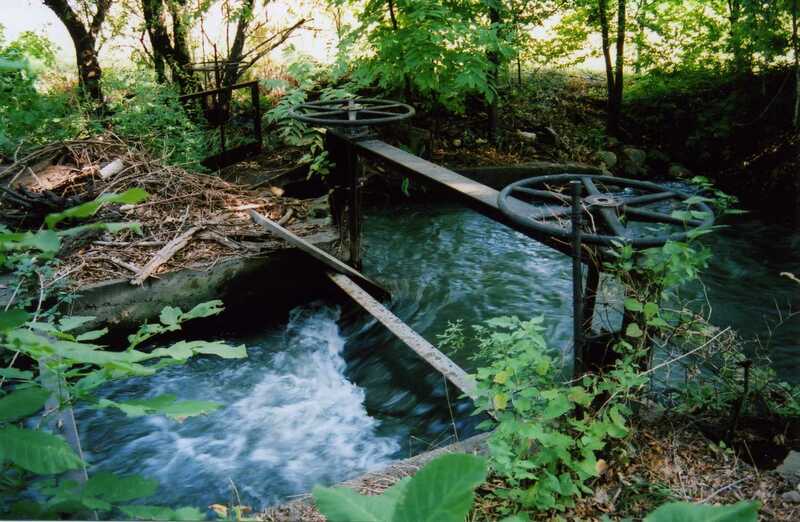 Farr enlisted the help of David Moore and others to turn even more water into the creek, altering and enlarging the canal from the Ogden River to the creek, and bringing more water into the tributary, more than was even needed for the mill or any claim of irrigation. After the building of Farr’s Mill, the enlarged creek or the “swale” was officially named MILL CREEK. 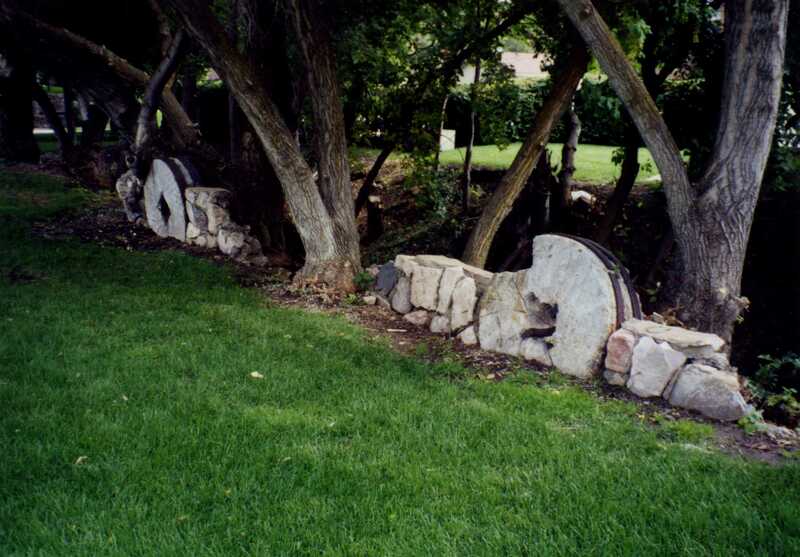 TODAY: Old mill stones on the bank of Mill Creek in memory of Farr’s Mill; located 1175 Canyon Road. As mentioned previously, the Barker family made the tenth ditch out of Mill Creek running north and west to their claims near the high bench in June 1850. They extended the ditch as far as today’s 7th Street opening opportunities to irrigate the newly Lemon surveyed farms between 12th Street and 7th Street. In 1851 Bishop Erastus Bingham supervised the settlers in extending the Barker ditch to 2nd Street, and in 1852 the people completed this extension under the supervision of Isaac Newton Goodale. From 2nd Street the ditch was continued on to Slaterville. In 1853 the people commenced to build a fort on 2nd Street, and Isaac Newton Goodale expanded the ditch to run on the south and north sides of Bingham Fort. 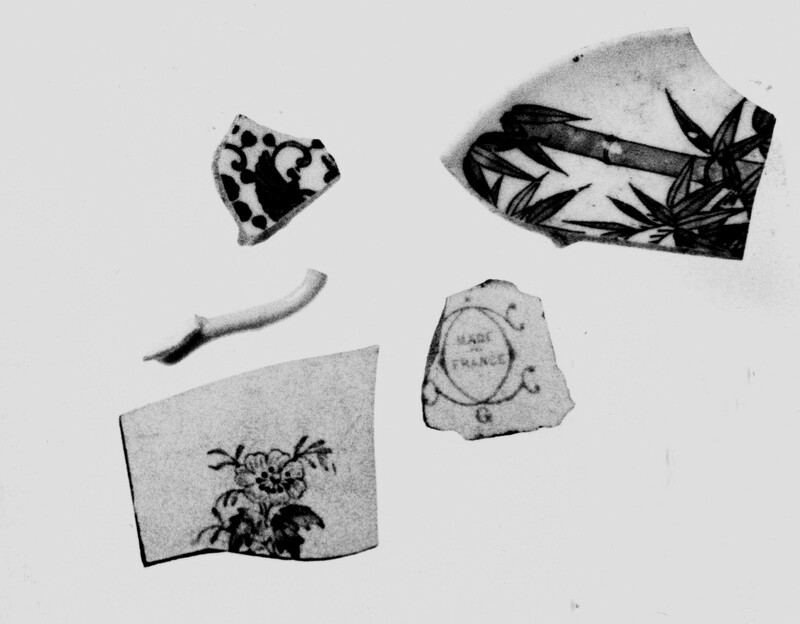 The women of the fort started the custom of throwing their broken china into the new ditches to keep the silt down. This custom continued for many years, and china chips can still be found in the ditch today. In time the name of the Barker ditch was changed to the Bingham Fort Ditch (AKA Lower Lynne Ditch). China chips found in the Bingham Fort Ditch. In the 1870s the shareholders of the Bingham Fort Ditch organized a company and kept records. 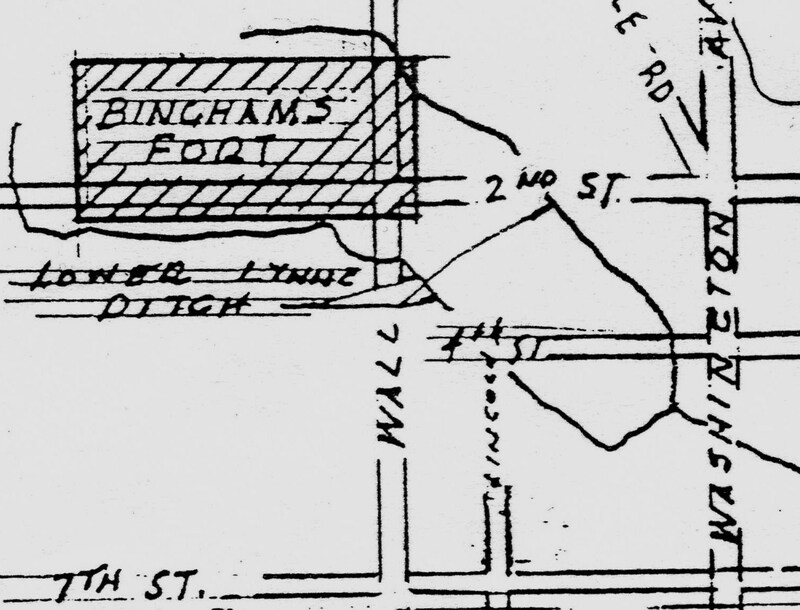 In 1880 when the state determined that ditches were now to be private property, the Bingham Fort ditch company incorporated into the Lynne Irrigation Company and continued to keep records to the present time. Today the Bingham Fort Ditch is still in use, known as the Lower Lynne Ditch, date of priority 1851 for the date of Erastus Bingham’s construction and water right number 10 for the Barker’s order of diversion from Mill Creek. The south branch of the Lower Lynne still runs to the old Bingham Farm in 2015. The Barker-Bingham Fort Ditch ran on both sides of Bingham’s Fort; the women of the fort threw broken china in the ditch to help keep the silt down; it was later named the Lower Lynne Ditch; drawing by Gordon Q. Jones. Barker-Bingham Fort Ditch was the 10th ditch from Mill Creek; many other ditches followed such as the Perryville Canal. The LEMON SURVEY named the area north of the Ogden River the “Farming Lands”, and for a few years the farms could be claimed without price. It was a choice place to settle, and the increasing population growth followed the expansion of roads, ditches and canals. The accomplishments of these early settlers have become our heritage and the beginning structure of our roads, ditches and community today. In the two years from 1848 to 1850 ten ditches were made from Mill Creek. Many many more ditches followed in succeeding months and years. As years passed some of these ditches changed names and length as the farms they irrigated changed owners; this made it confusing when trying to determine the original builder and priority date. For example, the Lorin Farr family did not come to Weber County until 1850; Enoch was five years old and Asa was not born until 1866, yet the ditches that bear their names received rights No. 1, 3, 4, and 5. When they grew up, Enoch and Asa used, improved and renamed ditches dug by the Chase-Hubbard -Shaw group. Prior to the 1924 Weber County Court preliminary decree concerning the water rights on the Ogden River, some farmers organized water companies and filed claims. The names and numbers of Mound Fort Ditches 1-5 were organized at this time, prior to the 1924 decree. The names, priority dates and sequence of rights were finalized in the 1948 decree. In the first column are the names of the first 10 ditches in 1948. In the second column are the honorary pioneer names given in 1948 to a prominent user on the ditch. In the third column are the priority dates and right number determined in 1948, and in the fourth column are the names of the original ditch builders. Ditches in green were discontinued sometime after the 1948 decree in the latter part of the twentieth century. Mound Fort Ditch #1 diversion from Mill Creek; located south of Mound Fort Middle School. Mound Fort Ditch #2 diversion from Mill Creek; located NW of intersection of Monroe and Canyon Road. Mound Fort Ditch #3 diversion from Mill Creek on the right and Mound Fort #4 diversion on the left; located on Adams Ave. between 14th and 15th Street. Mound Fort Ditch #5 headgate from Mill Creek; located on NE corner of Grant and 14th Street. The south branch of the Lower Lynne Ditch as it runs through the old Bingham Farm on W. 2nd Street. Val Holley, “Showdown at Geddes Gulch: How Prior Appropriation Ambushed Weber County”, Utah Historical Quarterly, Fall 2009, p. 334-337. 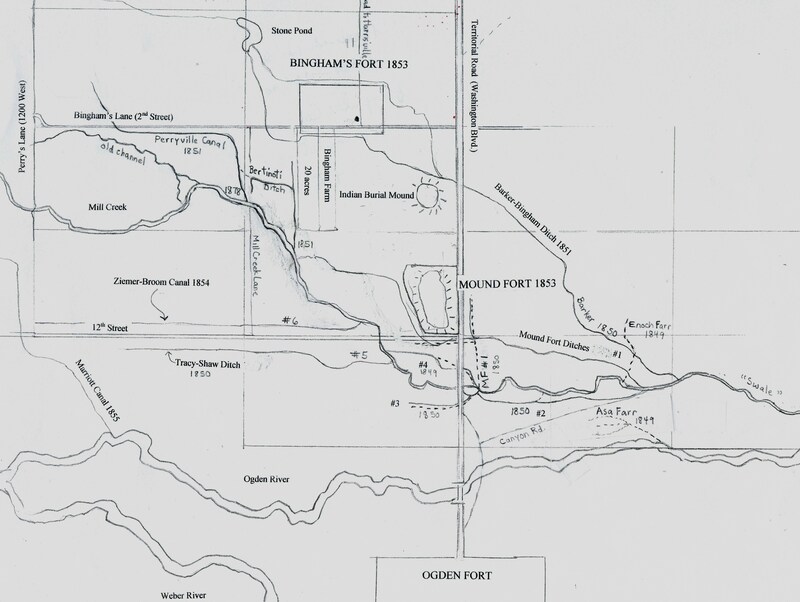 1924 decree of water rights on Ogden River, http://waterrights.utah.gov/cgibin/docview.exe?Folder=PDBOOK35000, p.211-218; 1948 decree of water rights on Ogden River, http://www.waterrights.utah.gov/adjdinfo/decrinfo/weber.htm, p. 16-22. [2a] Jerome Wheeler, History of Slaterville. 1899 Statement of David Moore, document in possession of Brendan James, Ogden, Utah, President of Lynne Irrigation Co. 1992-2007. Affidavit of Ambrose Shaw, age 75, filed Feb. 6,1899, in the District Court of the Second Judicial District of the State of Utah, in and for the County of Weber. The Lorin Farr family did not come to Weber County until 1850; Enoch was five years old and Asa was not born until 1866, yet the ditches that bear their names received rights No. 1, 3, 4, and 5. When they grew up, Enoch and Asa renamed ditches dug by the Chase-Hubbard -Shaw group. Milton R. Hunter, ed., Beneath Ben Lomond’s Peak, Salt Lake City Publishers Press, 1966, p. 69, 287, 288; Affidavit of Ambrose Shaw; Joyce B. Maw, Ogden Pioneer Forts and The People That Lived There, 2006, p. 87, 99-102; William Terry, Weber County History Is Worth Knowing, p.41; 1855 map from field notes of surveyor J. Troskolawski; printed in 1888 from Surveyor General’s Office Salt Lake City, Utah. Sketch of David Moore, p. IV, quoted by Maw, Ogden Pioneer Forts and The People That Lived There, p. 97, 29; 176. William W. Terry, WeberCountyHistory Is Worth Knowing, p. 43, 44. In 1899 the Mound Fort irrigation ditch may have had one diversion point with laterals similar to today’s ditches #1, 2, and 3 which are all credited to the Moore group. 1899 Statement of David Moore. [9a] Richard C. Roberts and Richard W. Saddler, A History of Weber County, Utah State Historical Society and Weber County Commissioners, 1997, p. 58. Maw, Ogden Pioneer Forts and The People That Lived There, p. 51, 172; 1948 decree of water rights on Ogden River, p. 20. Richard C. Roberts and Richard W. Saddler, A History of Weber County, p. 56, 57. Ibid, p. 60,61; Annie Jones Maw, 1875-1959, manuscript, Historical Information of the Early Ogden. Mariam Jones, Cynthia Harrington, Elias Bowen, Francillo Durfee, manuscript, 1999, online, p.28. Terry, Weber County History Is Worth Knowing, p.44. Over the years there were more Mills built on the creek: Phoenix Mills, Perry Mills, Holley Mill and the Woolen Factory. Lynne Irrigation records; 1948 decree; Andrew Jensen, Slaterville Ward, call number MS 8349/2, Church History Library of the Church of Jesus Christ of Latter-day Saints, Salt Lake City, Utah; ; Norman F. Bingham, Lillian B. Belnap and Lester Scoville, Sketch of the Life of Erastus Bingham and Family, 1950s, p. 12; Andrew Jensen, History of the Lynne Ward, p. 2. Weber County Utah Land Records, Church of Jesus Christ of Latter-day Saints Family History Library, Ogden, drawer 561, microfilm, 1654738; Terry, Weber County History Is Worth Knowing, p. 41. In 1924 there was one Moore family living on the #4 ditch. David Moore filed a land claim in this area in 1850. In 1924 this was known as the John Farr Ditch Co. In 1924 there were four Wilson families living on the #1 ditch; they were descendents of John Lyon Wilson who lived 3 houses west of Liberty on the south side of 12th Street (Phone interview with Bart Wilson Wolthuis, 27 June 2008). In 1924 there were five Chase families living on this ditch. In 1924 there were two Shaw families and three Tracy families living on this ditch. The Bingham Fort name is listed in the Lynne Irrigation records in 1874; this name was not listed in the 1948 decree.